then your application will work the same way in a web browser as it did in development mode. 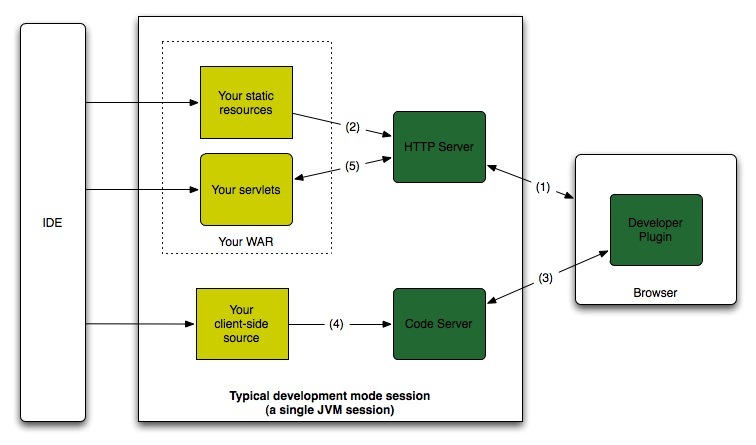 The rest of this section introduces development mode (previously called “hosted mode”) and production mode (previously called “web mode”) and explains how and when to use each. To launch a development mode session, from the command line run ant devmode, assuming you have an Ant build.xml file generated by webAppCreator. Tip: If you are using Eclipse, you can instead run the <app>.launch configuration file created by webAppCreator using the Run or Debug menus. If you didn’t use webAppCreator, you can manually run the main class in com.google.gwt.dev.DevMode found in gwt-dev.jar. Important: If you are not using a generated launch config, be aware that GWT development mode looks for modules (and therefore client-side source) using the JVM’s classpath. Make sure to add your source directories first in your classpath. Note: this section describes using development mode without the Google Plugin for Eclipse. 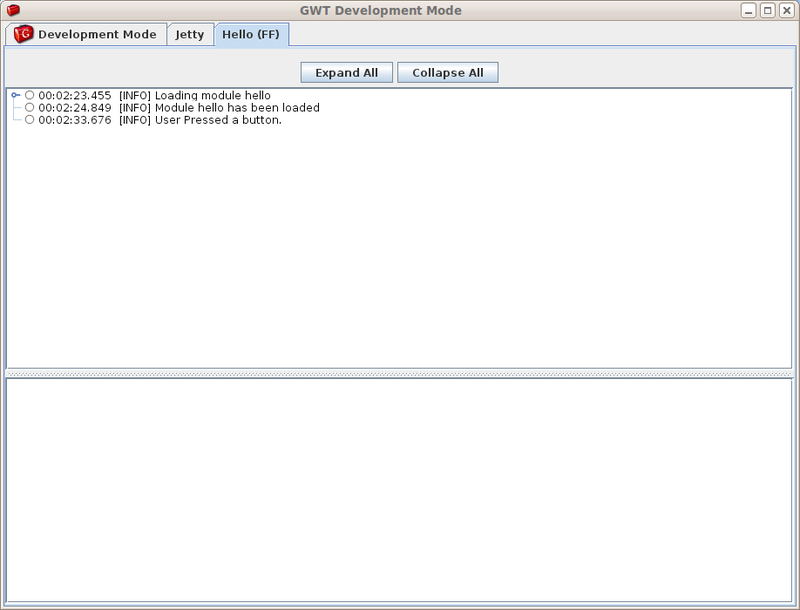 The GWT Development Mode window opens up initially with two tabs. The first provides an interface to launching your GWT module(s) and logs that aren’t specific to a particular module. 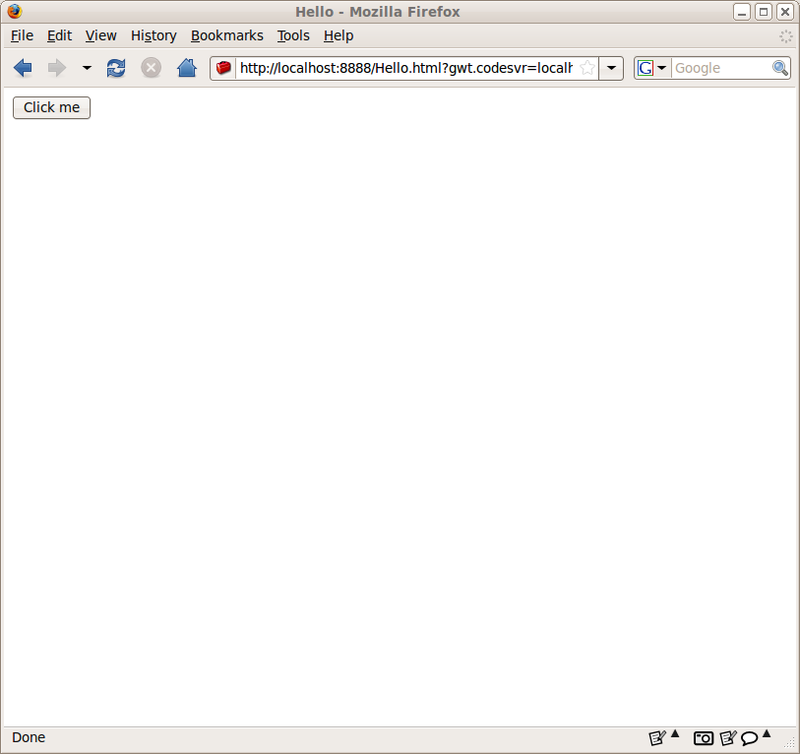 The second tab displays log messages from the embedded web server. By default, development mode runs an internal Jetty instance to serve your web application. This embedded Jetty instance serves directly out of your project’s war directory. 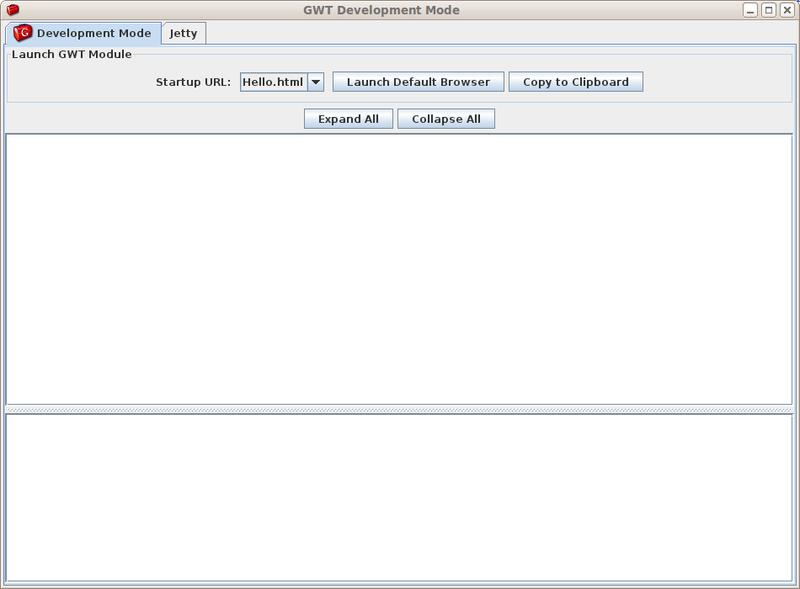 As of GWT 2.0, development mode uses a regular browser instead of an embedded browser. You can use any supported browser, including ones on other machines, as long as it has the GWT Developer Plugin installed. If you use a browser that does not have the plugin installed, you will get a message with an offer to download the plugin. Browsers are typically opened automatically via the -startupUrl command line option (though GWT will try to find plausible startup URLs if you do not supply any). To launch an application, choose the URL you want to use, and choose Launch Default Browser. GWT uses a number of heuristics to determine which browser to use, but depending on your setup it may not launch the one you want. In that case, you can choose Copy to Clipboard and the URL you need to launch will be copied to the system clipboard (and will also be shown in the log window). You can then paste this URL into any browser with the plugin installed, or you can type in the URL to a browser on a different machine (in which case you will have to change the host names in the URL as necessary). When a module is loaded in a browser, you will see a new tab which contains the logs for one URL in a particular browser. If there are multiple modules on one page, there will be a drop-down box to select which module’s logs are shown. When you refresh a page, there is a session drop-down box which lets you select which session’s logs to show. You do not need to restart development mode after modifying your source code. Instead, with Development Mode still running, edit client code or resources, save your changes, then refresh the page in your browser. On refresh, your code is recompiled with the changes and the new version is loaded into the browser. Refreshing the browser is much faster than closing and restarting Development Mode. You might notice that sometimes your changes take effect even if you do not refresh the browser. This behavior is a result of the way development mode interacts with the compiled code, but it is not always reliable. Specifically, it only happens when you make minor changes to existing functions and the IDE is able to replace the running code. To ensure your changes are included, make it a habit to always refresh the browser after making changes. Similarly, the Restart Server button in the Jetty tab allows you to restart the embedded Jetty server without having to close and restart Development Mode. This is useful when you have made configuration or code changes to your server-side code. All server-side classes will be reloaded from scratch with fresh code for your war/WEB-INF/classes and war/WEB-INF/lib folders. If you are getting an IncompatibleRemoteServiceException in development mode while using RPC, try restarting the server and refreshing the client. Debugging messages are displayed within the Development Mode log window. Some of these messages are from GWT. However, you can generate your own debug messages by using calls to GWT.log(). For example, modifying the standard project to emit a debug message inside the ClickHandler results in a debug message displaying on the log window whenever the user clicks the button. When the application encounters an exception, a message is printed on the module’s log window. The exception is highlighted with a red icon. In this example, when you click on the button in the browser window, a NullPointerException is triggered and the back trace for the exception displays in the status area below the log area. Clicking on the exception message or icon displays the full text of the exception in the message area below. The log window can display more verbose debugging if you invoke it by specifying the -logLevel command-line argument. Specifying the level of SPAM turns on many messages inside of the GWT engine. These messages are displayed in a hierarchical tree which can be manipulated by clicking on individual lines or by using the Expand All and Collapse All icons in the toolbar. When using an IDE such as Eclipse, JBuilder, or IntelliJ, it is easy to use the IDE’s built-in Java debugger to debug your module. Simply set a breakpoint somewhere inside your code, (such as the onModuleLoad() entry point) where you want the debugger to stop and let you inspect the state of your program. For an example of debugging in development mode using the Eclipse IDE, see the Getting Started tutorial, Debugging a GWT Application. 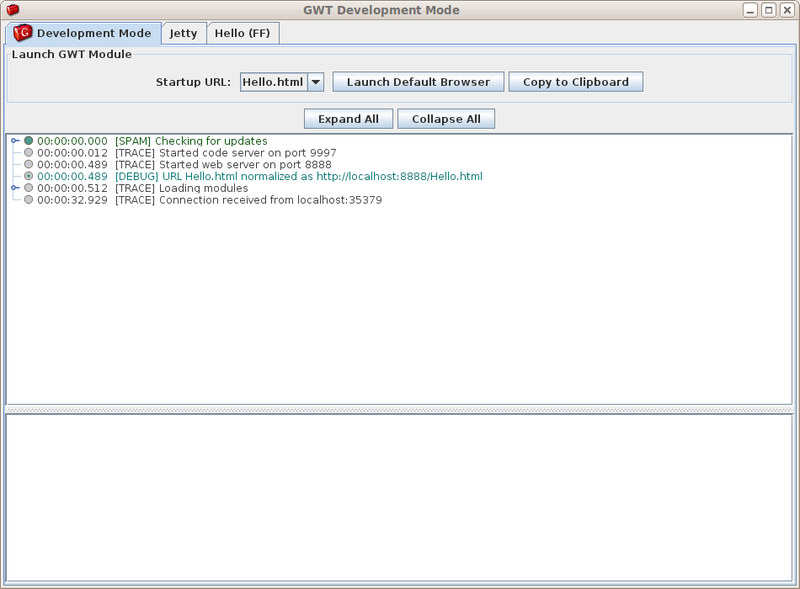 The -startupUrl parameter tells Development Mode which URL(s) to make available for launching. If the value excludes the domain, the domain is assumed to be localhost. The port is assumed to be the port running the embedded server. In the example above, this address is http://localhost:8888/Hello.html (with an additional parameter giving the location of the development mode code server). The final parameter (the one at the end with no flag preceding it) is the module or set of modules we care about. This value is required in order to correctly initialize the war directory with bootstrap scripts for any GWT modules you may wish to run. A full list of known language-related “gotchas” is available in the GWT documentation. GWT provides the -noserver option to the development mode shell script for this sort of thing. The -noserver option instructs development mode to not start the embedded Jetty instance. In its place, you would run the J2EE container of your choice and simply use that in place of the embedded Jetty instance. If you do not need to use, or prefer not to use, the Jetty instance embedded in GWT’s development mode to serve up your servlets for debugging, you can use the -noserver flag to prevent Jetty from starting, while still taking advantage of development mode for debugging your GWT client code. You need an EJB container, which the embedded Jetty server does not support. You have an extensive Servlet configuration (with custom web.xml and possibly server.xml files) that is too inconvenient to use with the embedded Jetty. You are not using J2EE on the server at all (for example, you might be using JSON with Python). When using the -noserver flag, your external server is used by the GWT Development Mode browser to serve up both your dynamic content, and all static content (such as the GWT application’s host page, other HTML files, images, CSS, and so on.) This allows you to structure your project files in whatever way is most convenient to your application and infrastructure. Configure your server however you need to; note the URL which contains the host page for your GWT application. Arrange all your static content files (such as the host HTML page, images, CSS, etc.) on the server however you like. Add the -noserver command line argument. Change the URL at the end of the argument list to match the URL you recorded in step #1. Compile your application once using the ant build target. Ideally, you can use GWT’s -war option to generate output files directly into your external server’s static content folder. Otherwise, you’ll need to copy the GWT output folder from war/<moduleName> to your external server’s static content. Be careful not to omit copying the files in Step #4: This is an action you’ll only have to do once, but is a necessary step. However, one important point to note is that you may need to replace the .gwt.rpc file if your application uses GWT RPC and if the types that your application serializes across the wire implement the java.io.Serializable interface. If these types are changed, or new serializable types are added to your RPC calls, the GWT compiler will generate a new .gwt.rpc file. You will need to replace the old file deployed on your web server with the newly generated file. However, if your web server targets the GWT compiler’s war output directory as the war directory for your application, you will not need to re-compile for these changes, and development mode will take care of generating and correctly placing the *.gwt.rpc file. -setProperty                   Set the values of a property in the form of propertyName=value1[,value2...]. After you have your application working well in development mode, you will want to try out your application in your target web browsers; that is, you want to run it in production mode. Because GWT widgets use a browser's native DOM components, the look and feel of your application might change from browser to browser. More importantly, if you are using a style sheet, you will want to inspect your application carefully on each browser. The GWT compiler supports the vast majority of the Java language. The GWT runtime library emulates a relevant subset of the Java runtime library. If a JRE class or method is not supported, the compiler will emit an error. Run the main class com.google.gwt.dev.Compiler using java from the command-line. If you used the webAppCreator script to create your project, you can use Ant to run the generated build.xml. If you are using the Google Plugin for Eclipse, you can compile your application by clicking GWT Compile Project button . In the above example, war/hello/hello.nocache.js is the script you would include in a host HTML page to load the Hello application. In this case, the host HTML page is located at war/Hello.html and loads the GWT startup script through the relative URL hello/hello.nocache.js. You may have noticed in the compilation target in the build.xml file generated by the webAppCreator uses the war output directory as both an input and output source. This doesn’t have to be the case, and you can easily configure the war directory as the output directory only, while using other directories as source directory paths by adding build targets to copy static resources from the source to the final output directory. See this war directory FAQ for more details. The other thing you may have noticed is that there are a number of other files generated along with the GWT compiler output. Of these there are a few that are key to deploying your application. If you’ve worked with GWT prior to the 1.6 release, the files in the war/hello directory are familiar to you. The only difference is where these files are now generated, and the fact that the host HTML page and CSS files are not in the same directory as the rest of the .cache.html/png files. 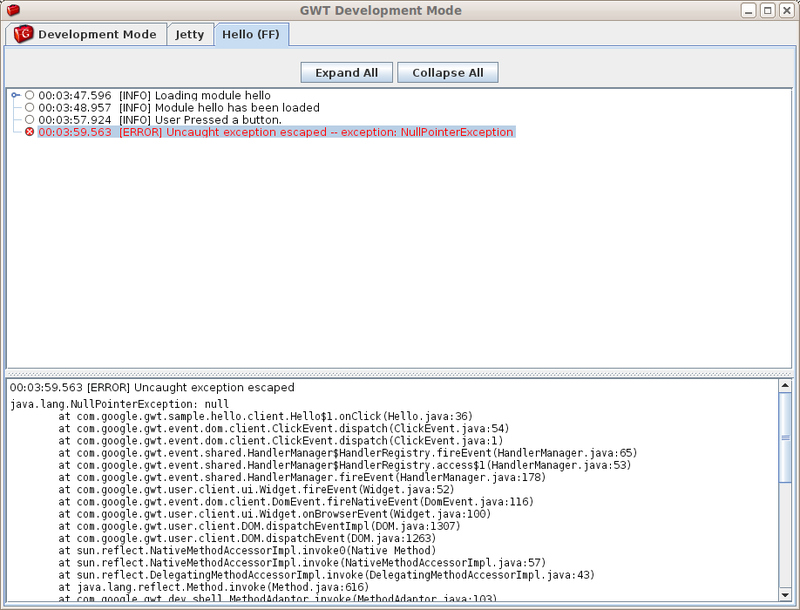 The path where these files are generated is controlled by the GWT module XML file. These are the key applications files to deploy you GWT application on your web server. The host HTML page is the first page your clients should visit when they browse to your application and is also where the rest of your application files are loaded from. To load your application, the host HTML page must contain a <script> tag referencing your GWT application bootstrap file (described below). You would typically include a <link> tag referencing your application CSS file as well, unless you inject the stylesheet directly by adding the <stylesheet> tag to your module XML file. You could also load the script from anywhere else in a website, but the default start page is typically the entry point that developers use to load their GWT applications. The host page from the Hello starter sample application mentioned above is shown below. You may have noticed that one of the generated files is named after your module, followed by a .nocache.js suffix. This is the GWT bootstrap file. Similar to the output subdirectory war/<app_name>, the name of this file is also controlled by the rename-to attribute in your module XML file. This file is responsible for choosing the correct version of your application to load for your client based on their browser and locale, or any other custom selection rule (see Deferred Binding). 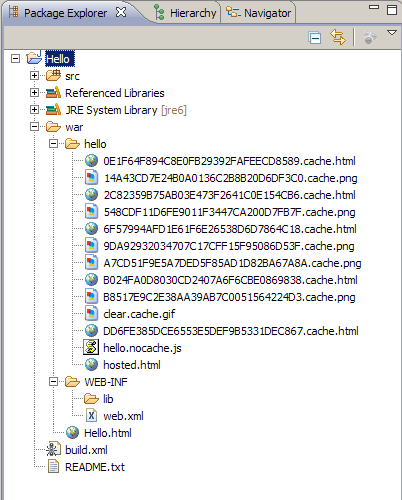 The various versions of your application compliant to each browser / locale are the <md5>.cache.html application files (discussed below). The host HTML page references this file so that clients visiting your page first download the bootstrap, and the bootstrap script in turn figures out which browser environment it is running in and determines the appropriate version of your application to load. See the documentation on the bootstrap process for more details. The <md5>.cache.html files generated in the war/<app_name> directory, along with the bootstrap script, are the most important part of the generated fileset. They represent one version of your application tailored to a specific browser (or locale). These are the application files that the bootstrap script selects after it determines which browser it’s running on. Another generated application file that isn’t strictly necessary to deploy your GWT application, but required if you’re using GWT RPC and the support for the Serializable interface for types transferred through RPC, is the <md5>.gwt.rpc file. The serialization policy file must be accessible by your RPC RemoteServiceServlet via the ServletContext.getResource() call. All public resources, such as image files, stylesheets or XML files, can be placed anywhere under the war directory or any subdirectory therein during development. As long as references to these resources in your GWT application code hold when deployed, you can expect your application to work properly in production. In GWT 1.6 and later, the <public> tag is still respected, so you can place public resources in a public directory, as defined in your module XML file, and these resources will be copied into the war/<app_name> folder. However, the best practice would be to place public resources in the war directory and work with them from that location. This complies with the standard Servlet 2.5 API specification, and makes it easier to deploy your application if you’re planning to deploy on a servlet container. If you’re using ClientBundle in your application, the generated bundles are placed in the war/<app_name> directory after compilation. Among other optimization and performance improvement techniques, GWT also offers the concept of “Perfect Caching”, which you can take advantage of if you deploy your application correctly. You may have noticed that the bootstrap script filename contains a .nocache.js suffix, whereas the rest of the GWT application files contain a .cache.html suffix. These are meant as indicators that you can use to configure your web server to implement perfect caching. The bootstrap script is named after a well-known application name (<app_name>.nocache.js), while the GWT application files all contain md5 sums in their names. Those md5 sums are computed from your GWT codebase at the time of compilation. The bootstrap script contains a lookup table that selects the right <md5>.cache.html file when your client first visits your site and loads up your GWT application. The bootstrap process is explained in greater detail here. Header merge Cache-Control "public, max-age=0, must-revalidate"
-XfragmentCount                EXPERIMENTAL: Limits of number of fragments using a code splitter that merges split points. -XfragmentMerge                DEPRECATED (use -XfragmentCount instead): Enables Fragment merging code splitter. -optimize                      Sets the optimization level used by the compiler. 0=none 9=maximum. -saveSourceOutput              Overrides where source files useful to debuggers will be written. Default: saved with extras.